Hello folks. Today, I managed to snag another brew from one of my favorite Island operations, and one which has been undergoing a bit of rebranding as of late. 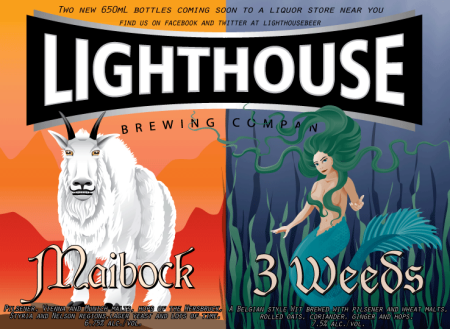 I refer of course to the Longwood Brewery located in Nanaimo, BC, a venerable brewpub that has been expanding its distribution in the past year and creating some new brands to share. I was quite excited to hear about this, since its damn near impossible to find any Longwood products outside of the Nanaimo area. However, that excitement has since abated somewhat due to a number of reasons. For one, I still await the arrival of the free samples of the full lineup that were promised to me months ago. Back then, I was contacted by an advertiser who works with the brewery who offered to ship me some; and to this date, none have arrived. Second, thus far, the majority of their beers I have managed to get my hands on have been very light, mild, and generally in tune with British-style ales and not so much the Pacific Northwest. Overall, it was a refreshing and fruity brew, but again, a little light for my taste. This is due to the combination of wheat and barley malts, which lends it a mixed malty profile that is neither particularly effervescent, yeasty, or syrupy. This certainly works in the refreshing department, but leaves it a little high and dry in the flavor department. In terms of fruit, there’s plenty of tartness, but very little sweetness or complexity. In short, it’s good, but I think they can do better. Hello folks. Today, I come to you with a review of a beer that I’ve been neglected for a few weeks now. While this beer has been available, at least in my area, since May, I’ve been hesitant due to the sheer number of Belgian Wits and other assorted wheat beers that have been making the rounds lately. But of course, I am a fan of the variety and I really can’t stand letting a limited release pass me by, so I decided to get on it! It’s known as the 3 Weeds Belgian Wit, and much like their recent Mountain Goat Maibock (which I have tried a few times but have yet to review), was released in May in honor of spring. Brewed in the traditional Belgian wheat style, it combines pilsner and wheat malts with rolled oats, hops and a dose of coriander spice and ginger. This makes for a brew that can rival the better wits I’ve tried, boasting a gentle malt profile, a yeasty backing, and a some spicy notes that are varied and complimentary. Overall, I enjoyed this beer quite a bit. And I was especially intrigued by the addition of ginger, which manages to compliment the coriander quite nicely. Whereas most Wits rely on orange rind or some other citrusy addition to do this, here you get a more layered spicy flavor in the end. It’s especially good as a warm weather beer, but was well-paired with the spicy food that I ate alongside it. I’m actually sorry I resisted it for as long as I did. This and the Maibock would have made a great two-fer review! Once in awhile, I find myself coming back from the beer store with a number of similar selections from different breweries. These I generally buy because they are limited releases, share a common theme, or are beers I simply haven’t tried yet. A few weeks ago, I made such a selection, recorded my observations, but then forgot to share them! 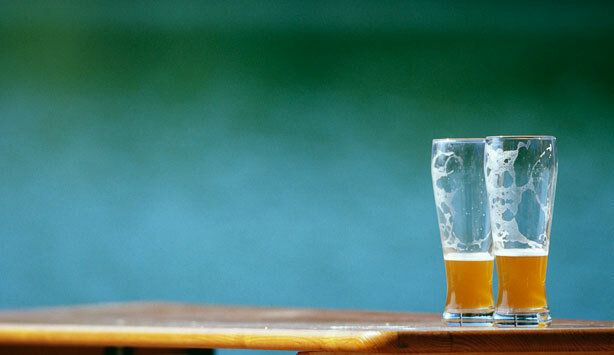 Alas, I discovered my error and am now correcting that, and bringing to you some summer beers that are sure to still be available. And I’d say that’s what they wound up with as an end result. 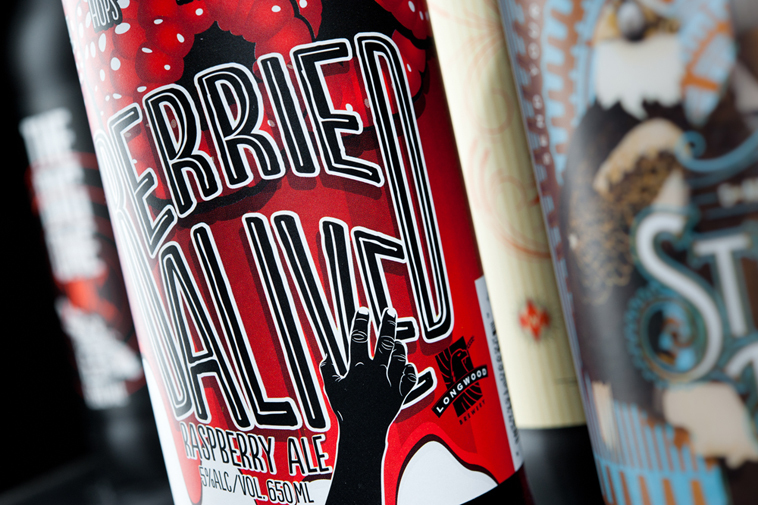 Though an west coast ale, the light, crisp and clean quality of the beer is more reminiscent of a lager or altbier. And as such, its quite consistent with warm weather, the outdoors, and summery evenings. Here we have a limited released that was produced by the folks at Granville Island Brewing as past of their Black Note Book Series. 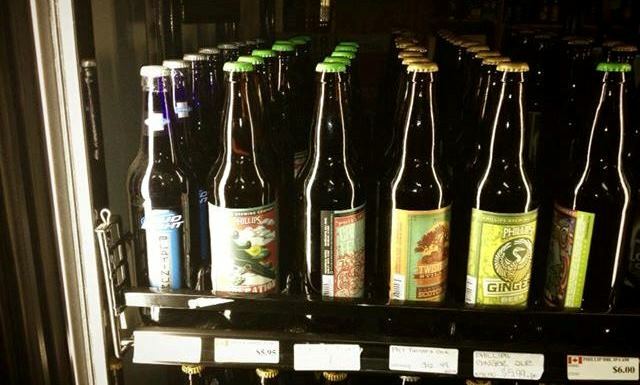 And as has been increasingly the fashion with GIB of late, they’ve been getting in on the craft brewing train with a long lineup of small batch beers, all of which appear to be consistent with the latest Northwest trends. This Cascadian Dark Ale, which combines aspects of a stout, IPA, is no exception, being a rather popular style of late. And for the most part, I found this one enjoyable and flavorful, though it was slightly on the light side. With a malt profile of a stout or dark ale and the hoppiness of an IPA, one expects a bit more challenge and flavor. However, the Cloak and Dagger remains a very pleasant spring beer and I hope to see it again. That’s all for now. Soon enough, I will be back with more seasonal brews, strictly summer one this time! And given the sheer supply of breweries and styles that are in vogue this season, I’m not sure what to expect. But that’s part of the fun of beer shopping, the selection! 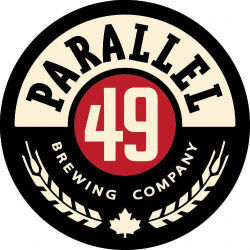 As anyone familiar with BC craft beers would know by now, the Vancouver-based Parallel 49 brewery is renowned for their interesting and weird combinations, producing beer that is both appealing to drink and esoterically complex. And they seem to know no limits when it comes to variation and experimentation, combining different processes, ingredients, and merging disparate styles to create something new every few weeks. And whenever they decide on a new combination, it comes in the form of a limited release. As you may be able to tell, it was quite difficult to describe the flavor of this beer. All throughout, I had the feeling that I was getting notes of something sweet, distinct, and not really consistent with malt or hops. I wasn’t sure how to describe this, and didn’t want to fall back on the all-too-convenient “like rosewater”, especially since I’ve never tasted it before. 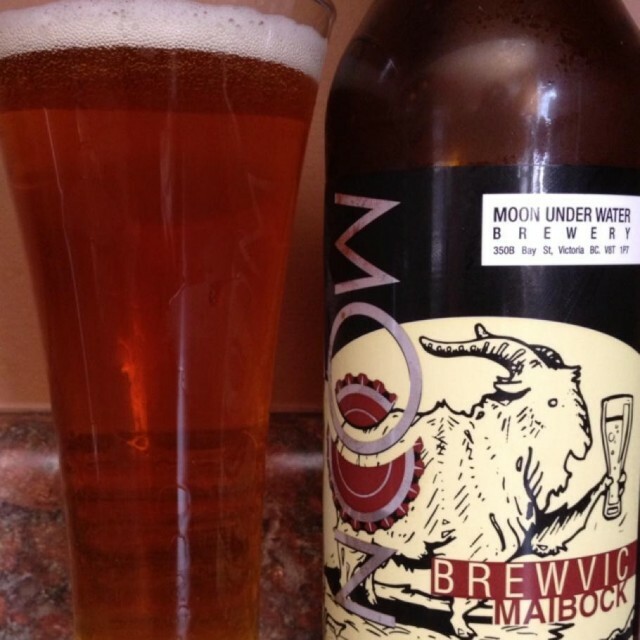 But the end result of this beer is certainly something that most beer drinkers will at least partially recognize – a malt forward beer that is reminiscent of a nice amber ale that also comes with a herbal/floral taste provided by a rosewater tincture. Not P49s best beer by my measure, but definitely worth sampling. 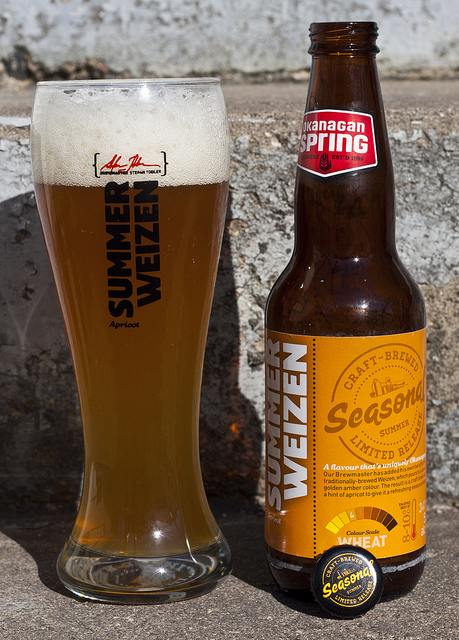 Another wheat beer from another long-standing BC brewery, and just in time for summer. Truth be told, I haven’t really been paying much attention to Okanagan Spring in recent years. After a few years of living here, and being able to find much of their lineup back in Ontario, I felt I had sampled everything they had to offer. It’s always good to see that the craft brewing bug is getting around! A fitting wheat, this limited release is apparently the brewery’s tribute to the Okanagan’s “fruitful history”, which I can only assume refers to its vast fruit-cultivating operations. And consistent with what one would expect from a good wheat, it is golden orange in color, appropriately yeasty, highly fruity, and refreshingly smooth. I have yet to divine the exact combination, but in conjunction with the wheat malt and yeast, it boasts a variety of fruit flavors. Along with my parents and darling bride, I managed to get a glass of this after watching them compete in some Dragon Boating down at the Gorge. And it was a pretty good drink to accent a rather hot and sticky day! Overall, not a bad wheat. Granted, McAuslan Breweries did this one already, and made a pretty good go of it, there is nothing wrong with a little imitation. And whereas McAuslan’s St. Amboise Apricot Wheat was a kristalweizen – clear, and light and fruity – this beer is an unfiltered heffeweizen – yeasty, cloudy, smooth and fruity. 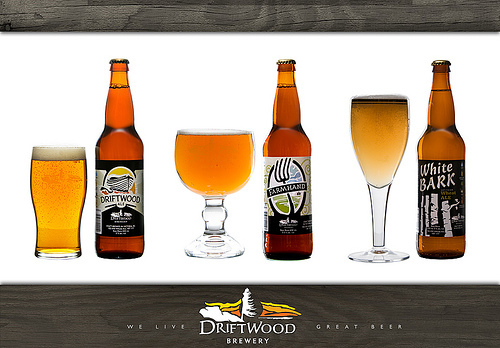 Due to the sheer volume of good beer and great limited releases they’ve produced over the years, I think it’s safe to say that Driftwood has become one of my favorite breweries of all time. In addition to their Fat Tug IPA, Naughty Hildegarde, Twenty Pounder IPA, and many Flanders-style sour ales (the epitome of brewing perfection! ), they’ve also been known to produce some excellent Belgian-style ales as well. 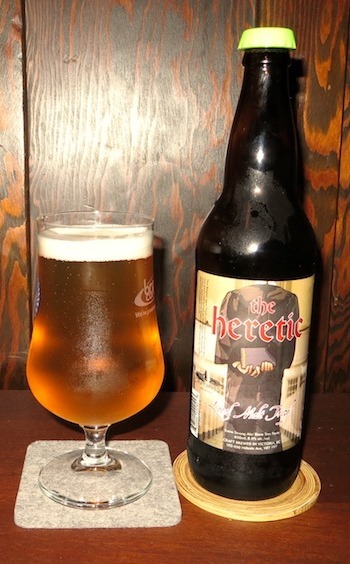 The lastest is known as The Heretic, a Belgian-style Tripel that is the second in a series made using locally grown, Saanich peninsula barley. And since the last one was a Dubbel (the Clodhopper), it only made sense to up the ante with this one! In addition, Heretic is brewed using candy sugar, a tradition that is employed in several strong Belgian ales to increase their alcohol content, the most renowned being Duvel. The end result is a beer that is light in color, heavy on alcohol (8% alc/vol), and boasts some strong, coarse, and spicy malts with an infusion of herbal hops. And I can honestly say, as a man who’s not normally a fan of this type of beer, that this one was most inoffensive and actually quite appealing. In truth, and with all due respect to the venerable brewery, Duvel was never a favorite of mine. In fact, I’ve never been much of a fan of the particular style of Belgian strong ale that involves added sugar. Though I am a big fan of powerful ale, somehow, beers made in this fashion always seemed too light and too coarse for me. And yet, this Driftwood product managed to not only nail the recipe but still remain appealing to my palate. Good job, guys! Looking forward to the next limited release!